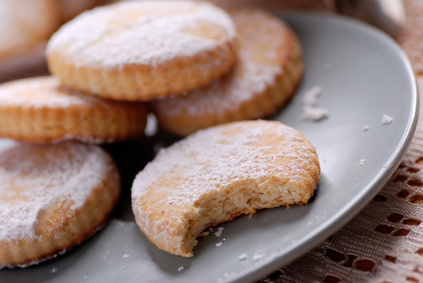 If you’d like to keep a supply of biscuits to hand but aren’t sure that you’ll have the time to bake them when they’re much-needed, turn to this quick and easy shortbread recipe. It uses basic storecupboard ingredients and takes minimal time to create the dough which can then be frozen for up to six weeks. When the biscuit barrel runs low just remove a roll or two of dough from the freezer, defrost and cut and bake in ten minutes as normal! Add flour, semolina and vanilla and bring together to make a dough. Roll out into 3-4 cm thick rolls. If baking immediately slice into 1cm thick biscuits and lay on baking tray leaving space in between each. Prick the tops lightly two or three times with a fork. Bake for approximately 10 minutes. Remove from oven and leave to cool slightly on tray to allow biscuits to firm up. After a few minutes transfer them onto a wire rack for cooling. When cool sprinkle lightly with sugar or icing sugar. If planning on keeping dough for baking at a later date, wrap each dough roll in foil or cling film and freeze for 4-6 weeks. Remove from freezer and allow to defrost in fridge before baking.